The Kansas City Chiefs only need to avoid defeat at home in Week 14 to book their playoff berth, but they host a Baltimore Ravens team that have never lost at Arrowhead Stadium. Chiefs quarterback Patrick Mahomes' MVP case would be significantly boosted if he were to light up a stout Ravens defense, though. Elsewhere on Sunday, Drew Brees, one of Mahomes' rivals for that award, will hope to feast on the Tampa Bay Buccaneers after being held in check against the Dallas Cowboys last time out. With the help of Opta, we preview seven of the biggest contests this weekend. The Ravens head to the Chiefs having never lost in Kansas City, where they are 3-0 in franchise history. Mahomes and the high-octane Chiefs offense are averaging 37 points in their 12 games this season, the fourth-highest of all time. 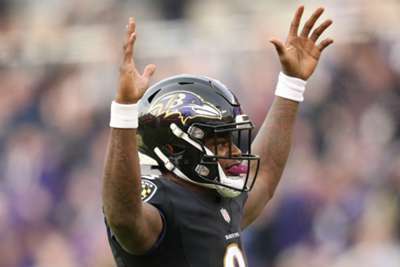 On the other side of the ball, Baltimore are allowing only 17.8 points per game, the fewest across the NFL in 2018. Man i can’t wait to be in arrowhead this week! #ChiefsKingdom going to have it rockin! Bill Belichick and Tom Brady will be assured of another AFC East title if New England win or tie. However, a defeat would be their fourth road loss of the campaign, which would be their most in a season since 2013. James White leads the Pats with 10 total touchdowns, though he has not found the end zone in any of his previous three appearances. Saints quarterback Brees will be looking to bounce back after throwing for just 127 yards in a loss to the Dallas Cowboys, which was the second time this season he had been kept under 130 yards through the air. Tampa Bay scored 48 points in a 48-40 Week 1 victory over New Orleans and they are seeking their third straight win having lost the previous four. Having won five straight home games, the Texans are seeking a sixth consecutive triumph at NRG Stadium, which would tie a franchise record from 2016. Much of their recent success has been built on running back Lamar Miller's re-emergence and he already has four 100-yard rushing games in 2018, the fifth-most in the league. Including the playoffs, Cincinnati have beaten the Chargers on four of the last five occasions, with their only loss coming in the wildcard round of the 2013 playoffs. The Bengals have lost two successive road games, though, and are bidding to avoid dropping three in a row for the third successive campaign. The defending Super Bowl champion Eagles will hope to force more turnovers on defense having done so on just nine occasions this term - tied for the second fewest in the NFL. Philadelphia lost their last road game 48-7 against the Saints and put up just 196 yards on offense, which was their lowest total away from home in 11 years. Chicago are seeking a fourth successive home victory for the first time since 2012, but they face a Rams team that have already been confirmed as NFC West champions and they will clinch a first-round bye in the playoffs with a win. Los Angeles running back Todd Gurley leads the league with 1,175 rushing yards and is bidding to become the first Ram to win the rushing title since Charles White in 1987.